Vassar area residents Shari Weber, left, and Frances Summers review maps and information about construction of a roundabout at U.S. Highway 75 and state highways 31 and 268, during an informational meeting hosted by the Kansas Department of Transportation at the Osage City Community Building Monday evening. KDOT officials reported bid letting for the project is expected to occur in the spring with four phases of the construction lasting into 2013. Current plans are to build temporary roadways to bypass the roundabout construction. 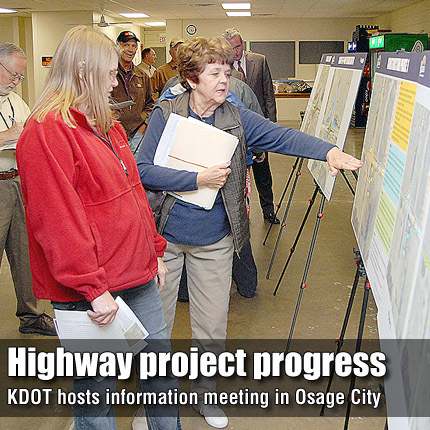 At the meeting, KDOT also reported the K-31 project in Osage City, above, is expected to be completed this week and Market Street to be reopened.